with a holistic web security solution. If your security solution does not include DDoS mitigation, a dual Web Application Firewall (WAF) and bot risk management, you’re leaving your business wide open to financial loss. 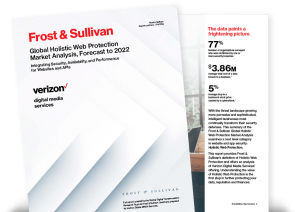 Download our Frost & Sullivan report summary to learn why they rated our multilayered cloud-based solution at the top of its Global Holistic Web Protection Market Analysis. DDoS Shield protects cloud-based and hosted infrastructure. Combine with HTTP Rate Limiting, and you have an extra layer of protection for your web services. We’re the only provider with the ability to test potential changes against production traffic while still protecting your websites using previously tested rules. You’re never left exposed. Advanced botnet detection and mitigation leveraging fingerprinting technology isolate botnet attacks while enabling legitimate users continued access. With 57+ Tbps to absorb even the largest DDoS attacks, your websites stay online and protected at all times. Learn even more. Fill out the form at the top of this page now to get the complete 141-page Frost & Sullivan market analysis now ­– a $4,950 value ­– yours FREE.